Greensfelder attorney Kevin O'Malley has been nominated by President Barack Obama to serve as the U.S. ambassador to Ireland. 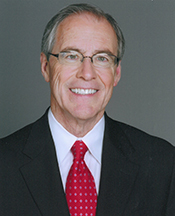 O’Malley is an officer in the Litigation Practice Group with more than 40 years of trial experience. He is the leader of the Medical Negligence and White Collar Crime and Regulatory Compliance areas of practice. O’Malley is a Fellow of the American College of Trial Lawyers. He is the senior author of the nine-volume treatise, Federal Jury Practice and Instructions, used in federal trials throughout the United States. In 2013, he was the recipient of the Award of Honor from the Lawyers Association of St. Louis. O’Malley has been continuously selected for inclusion by the editors of "The Best Lawyers in America" for his work in three categories: medical negligence defense, white collar criminal defense and personal injury litigation. He is listed in Who’s Who in America, Who’s Who in American Law, and Who’s Who in American Politics. In 2009, Missouri Gov. Jay Nixon appointed O’Malley as the only non-physician member of the Missouri Board of Healing Arts, the state’s licensing and disciplinary body for physicians. The physicians elected him as the board's president last year.